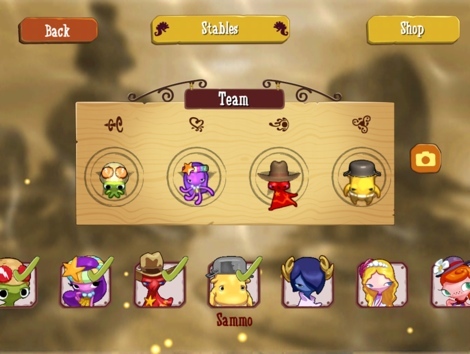 Read our beginner's guide to get the most from the game's slimy looking heroes. 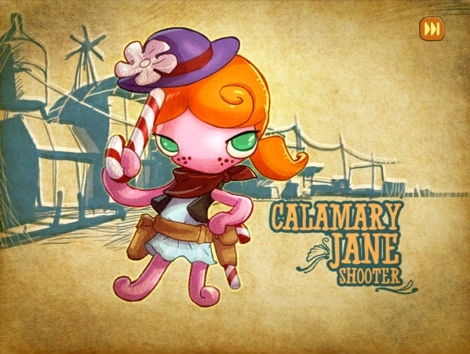 There's a lot to love about The Game Bakers' Squids Wild West, from the detailed 2D worlds to the cute Squids. With this in mind, we created a cheats and tips guide to help you on this thoroughly entertaining undersea adventure. Shooter: Fires a ranged attack, great for hitting enemies at a distance. Trooper: Delivers a devastating ground pound that hurts enemies within the damage radius. Scout: Capable of performing a speedy dash that helps you reach areas faster. Healer: As the name implies, this type of Squid heals the rest of the party. Before attempting a mission, you can create a team of four Squids. The order you place them in determines which Squids go first, second, third and fourth during play. 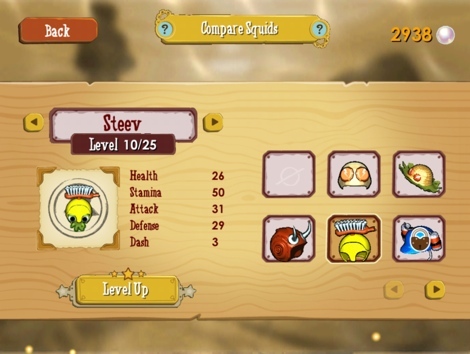 All Squids feature individual stats spread across the following categories: Health, Stamina, Attack, Defense and Dash. Spend pearls to increase Squid stats for those aforementioned categories. This will help you defeat tougher enemies. 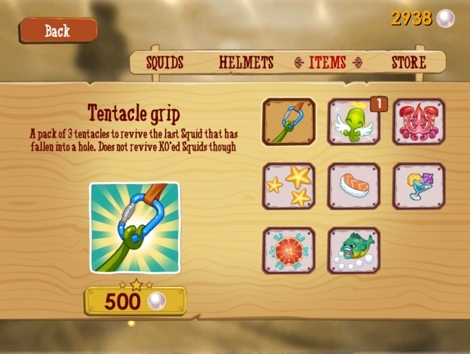 Squids Wild West contains an assortment of cool helmets that boost Squid stats. Some are available from the beginning, others you purchase with pearls. Don't be afraid to unleash the game's items upon your adversaries, as these things do an excellent job turning the proverbial tide. Shuriken (200 Pearls): A pack of five. Use to hit several enemies at once. Sushi (400 Pearls): A pack of three sushis. Makes Squids hit stronger while restoring some health and stamina. Cocktail (600 Pearls): A pack of three cocktails. Restores stamina, some health and abilities. Explosive Jellyfish (500 Pearls): A pack of five. Packs an explosive punch. Tentacle Grip (500 Pearls): A pack of three tentacles that revive the last Squid that fell into a hole. Miracle Tentacle (1,000 Pearls): A pack of three tentacles that revives the last KO'ed Squid, or one that fell into a hole. Mighty Kraken (1,000 Pearls): Summon this beast to weaken enemies. Pearlfish (4,500 Pearls): Doubles the pearls you collect in battle. Find the Secret Star hidden in each level. Complete a mission with all Squids to receive the Survival Star. 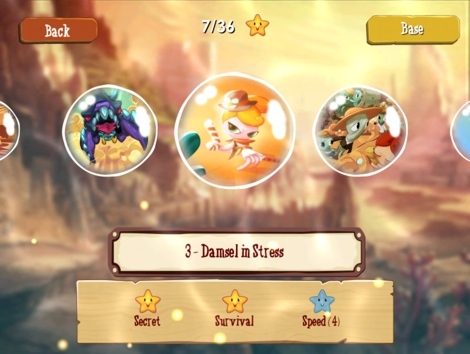 Finish a mission within a set number of turns to earn the Speed Star. Earn Bonus Pearls By Executing Combos. Bounce Kick combo is achieved by hitting an enemy after bouncing on something. Double Bounce, Triple Bounce and Super Bounce are achieved by hitting an enemy several times in the same movement. Ninja Bluff is achieved by damaging an enemy while using an ink cloud. Double Kiss by healing two teammates in the same movement. Quake Shot by hitting a lot of enemies in one stomp. Eagle Shot by shooting an enemy from the longest range that you can. Team Trick is achieved by hitting an enemy and pushing it onto a spiky shell. Be on the lookout for objects within the environments that can help or hurt your team. That said, push enemies into spiky urchins and exploding lobsters whenever possible. If you don't have enough pearls or the time to grind it out, consider spending some real-world cash. 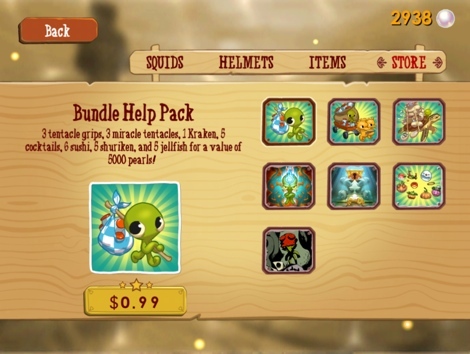 Bundle Help Pack ($0.99): Three tentacle grips, three miracle tentacles, one Kraken, five cocktails, six sushi, five shuriken and five jellyfish. A 5,000 pearl value. Chariot Help Pack ($1.99): Ten tentacle grips, ten miracle tentacles, three Kraken, 15 cocktails, 15 sushi, 15 shuriken and 14 jellyfish. A 15,000 pearl value. Turtle Help Pack ($3.99): Ten Kraken and all your item slots filled with 99 items for a value over 100,000 pearls. Kraken Eye ($2.99): Level up all Squids to max level. Legendary Treasure ($4.99): The Legendary Treasure will unlock all missions, Squids, Seahorses and helmets from the game, as well as level up all Squids to max level and credit 500,000 pearls. Kickstarter Pack ($1.99): For the price of a candy bar, unlock nine helmets from Squids 1 (customization only, no bonus stats) and support Squids developers so they can make free updates and new games. Ultimate Squids Fan ($4.99): For the price of a burger, unlock the exclusive Ragnarok helmet (customization only, no bonus stats) and support Squids developers so they can make free updates and new games and love you forever. Small bubbles indicate a Squid's stamina. When these are gone, your turn is over. Drag your fingers around the screen to pan the camera. When you want to go back to your Squid, tap the bubble featuring that character. Pinch the screen to zoom in or out. Throw yourself against an enemy to do a melee attack. The spiky shell power-up hides your Squid inside a comfy shell for one turn. Hit two enemies for a double bonus. Replay missions for extra pearls. Look for enemy weaknesses, then exploit said weaknesses. Perhaps you can't approach a boss head-on. Try from behind.